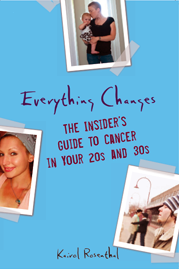 Everything Changes – The Guide to Young Adult Cancer » Why I don’t want to have children. Why I don’t want to have children. I remember sitting in my mom’s car in my mid-twenties, tears sliding down my face. “Mom, I have something to tell you: I don’t want to have kids.” I felt horrible denying her grandchildren, and felt like there was something wrong with me too. Everybody I knew was feeling the biological clock ticking or was at least excited about the prospect of it in the near future. My mother was, and still is, incredibly supportive and understanding. For me, it has been a harder ride. There are lots of reasons I’ve never, ever wanted to have children. I’ve always felt my career was more important. I’ve felt (and still feel) that I can do more good in this lifetime trying to help a part of society rather than focusing intensely on raising one or two people. Plus, as a nanny for many years, I got a great glimpse into what parenting is all about. Sometimes I wonder if I used up my parenting credits on someone else’s kids. But I suspect that I’m probably just an educated shopper and that if others took a test drive before committing, our population would be smaller. I try hard, and most often succeed, in feeling empathy for cancer patients who as a result of their disease cannot conceive or carry a child. Though most often, I say to myself secretly, I wish we could trade reproductive systems so I would not have to worry about birth control. I suppose this harsh but realistic thought is better left unsaid. Though I do wonder if I am the only one out there thinking it.